WheelTurnerHawaii.com: The Festival Of Sugar and Love 3 Events Schedule. 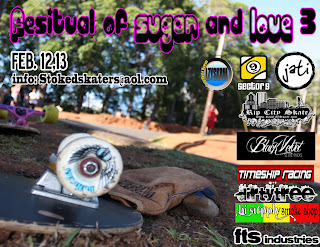 F.O.S.A.L 3 this year is set for Feb 12 & 13, at The Loop. Riders who are camping should all have their names in already. BBQ grill will be at event... Bring food to throw on. Remember, this is an outlaw slide jam... Roll at your own risk. 930am - Camp set up opens. 1100am - Slide Jam sign up. MUST BE REGISTERED TO COMPETE. PLEASE BE ON TIME. WE WILL BE RUNING ON SCHEDULE AND CANNOT WAIT AROUND FOR RIDERS. Bring smiles and positive vibes. Be ready for a awesome weekend of turning wheels.